It’s the future! But the Catholic church doesn’t seem ready to embrace it. 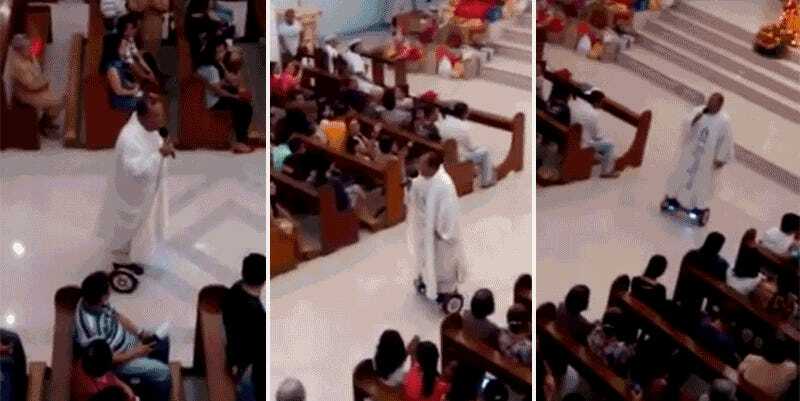 A priest in the Philippines recently rode a hoverboard during a Christmas Eve Mass. But the Diocese of San Pablo has now suspended the poor hoverboarding Father. Video of the priest hit social media and instantly went viral. But conservative members of the church and the local Diocese of San Pablo were not pleased. They said that the priest has apologized and will take some time off to reflect on his hoverboarding ways. “He will be out of the parish and will spend some time to reflect on this past event. He would like to apologize for what happened,” the diocese said. His Holiness the Chill Pope™ has yet to weigh in, but here’s hoping that the church becomes less hover-phobic in the future. Oh, and less homophobic and ladyphobic too.